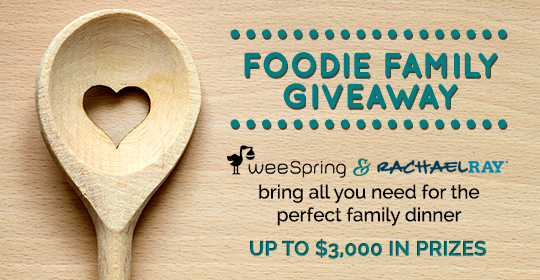 We got together with the team at RachaelRay.com to gather together some easy and nutritious recipes for the family. 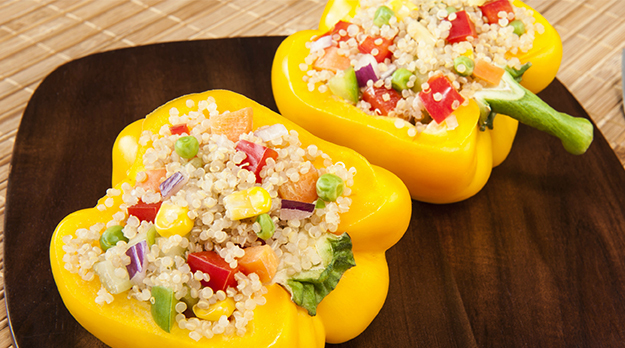 Quinoa finds a new home in Rachael’s stuffed peppers. Bring the quinoa and stock to a boil. Cover and simmer until the liquid is absorbed and the grain looks translucent, 12-15 minutes, then fluff with a fork. You will have about 4 cups of cooked grain. Drizzle the bell pepper halves with EVOO and season both sides with salt and pepper. Roast cut-side down until the skins begin to char and the peppers are just tender, about 20 minutes. Remove from the oven and cool to room temperature, then arrange in a baking dish cut-side up. Meanwhile, heat 3 tablespoons EVOO, three turns of the pan, over medium-high heat. Add the garlic, eggplant, onions and chili peppers and season with salt and pepper. Cook, partially covered, to tender, 10-12 minutes. Add the herbs and tomatoes and combine with the quinoa. Fill the pepper halves with the quinoa and vegetable stuffing and drizzle with EVOO. Cool and chill for a make-ahead meal. To serve, roast in a 375°F oven until the peppers are hot through. Serve the pepper halves topped with lots of cheese crumbles.